Yes, I’m a dork and made a cupcake flag (minus some stripes) to take to a barbecue later today. Mini red velvet cupcakes with cream cheese frosting. The white stripes are just plain frosting; the red have sanding sugar; the blue have blue sprinkles; the stars are made from fondant. July 4, 2007 | Filed Under Misc. Not at all dorky! V. cute. I made a fireworks cake, which I barely had enough time to finish and shlep to work, much less photograph, so color me impressed with yours. that looks really great! very impressive! What a great idea! I love it! I bet it was the hit of the party. Dorky? Oh, I beg to differ. Stupendous is more like it! 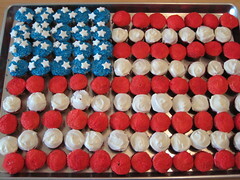 I wish there was a cupcake flag at my BBQ!